Besakih temple is the most important temple in Bali. 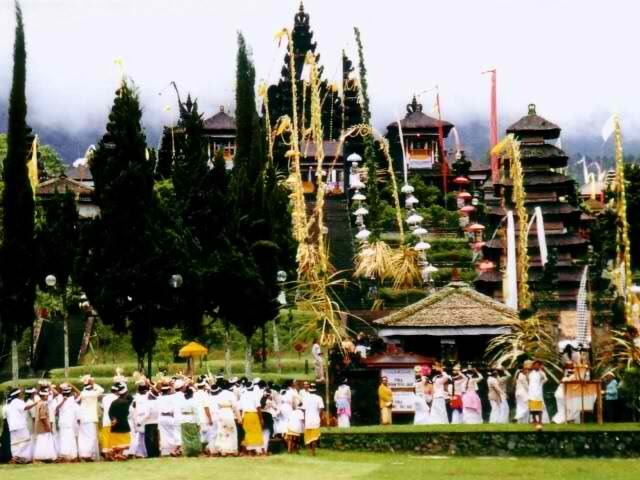 Known as the Mother Temple, Besakih sits on the western slop of Gunung Agung, the most holy place for Balinese Hindus. Getting to Besakih from Kuta is quite easy. Simply head east towards Sanur, connections with the Kusamba Bypass at Tohpati. Follow the fast track coastal route until you see signs for Klungkung, at which point you head north looking out for sign for Besakih. You should be at Besakih in around 2 hours from Kuta. The temple can be a bit of a tourist trap, especially during the day. In the evening it quietens down and may be a better time to visit. Besakih does have a system of temple guides, which can be annoying for some people. When I visited Besakih in 2003 I went with 6 Balinese people and was never approached by touts. I was also allowed to join my Balinese friends in visiting temples and receive blessings from the pemangku(temple priest). Inviting a Balinese friend to go with you or hiring a driver would be a very good idea if visiting Besakih temple in the daytime. 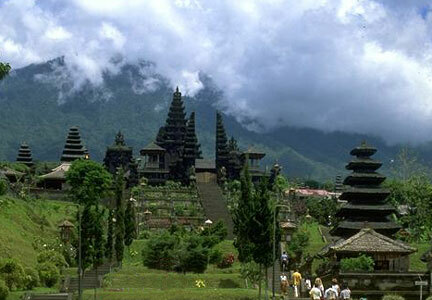 Besakih is not just one temple, but a large complex of temples extending up the mountain, over a distance of 3km. The offical opening hours are daily 8am-5pm. Entrance is 7,500rp, parking 1,000rp, camera use is 1,000rp and video use is 2,500rp. In respect to the culture wear a sarong and sash, available outside from the many vendors. Besakih temple’s history dates back to megalithic times, with the most ancient section Pura Batu Madeg (temple of the Standing Stone) built around a central rock. Balinese people believe the founder of Besakih to be Sri Markandeya, a Javanese priest who was in Bali around the 10th Century AD. Besakih was already very important to the Balinese by the time the Javanese Majapahits conquered Bali is 1343. After that time the temple became the central temple of the Gelgel and Klungkung courts. Exploring the Besakih temple complex means a lot of walking and stair climbing. One strategy is to visit the largest temple, Pura Penataran Agung first, then take your time meandering the other points of interest. If you feel like checking out the more remote parts of the temple, head to Pura Pengubengan, which is 2km through the north at the northern end of the temple. A little reading can make your visit of temple layout all the more enjoyable. According to Balinese Hinduism, the Trimurti or ‘3 shapes‘ of the Supreme Deity are represented in 3 separate temples. Pura Kiduling Kretek (Temple South of the Bridge) represents Brahma the creator, Pura Batu Madeg (Temple of the Standing Stone) represents Wisnu the protector and Pura Penaturan Agung, the largest temple represents Siwa the destroyer. The Panca Dewata (5 gods of the 4 directions and center) are represented by 5 smaller temples. These are Pura Penaturan Agung (center), Pura Ulun Kulkul (west), Pura Gelap (east), Pura Batu Medeg (north) and Pura Kiduling Kretek (south). Warungs and drinks sellers line the street outside Besakih.